We always enjoy getting our customers together to discuss their experiences as hoteliers in a rapidly-evolving history. Not only do we get to learn about their pain points, but they get to discuss with one another and brainstorm for future success. Earlier this month, we hosted an executive roundtable event with customers from the Boston/Cape Cod area. 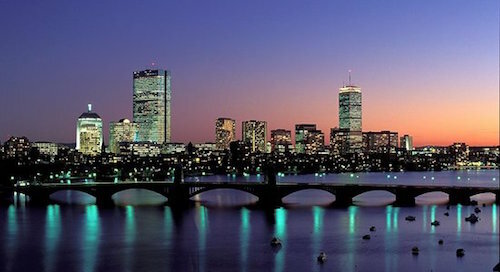 Participants hailed mostly from independent properties, including the Charles Hotel in Cambridge and the Lenox Hotel in Boston, with one attendee from Pyramid Management Group, which manages both branded and independent properties. During the session, we found some pretty clear trends for the hospitality industry. We also discovered common pain points for independent hotels, and discussed strategies for future success. The modern traveler has changed, leaving many of our customers scrambling to adapt to evolving guest behaviors and expectations. Guests are increasingly using mobile devices for everything from searching for and booking travel to posting about their experiences on social media. Additionally, online travel agencies (OTAs) are consolidating through mergers and acquisitions, reducing competition. 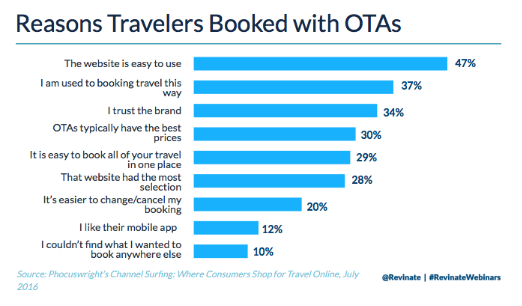 They’re also taking more of the market share pie of online bookings as consumers choose to book through OTAs over brand.com sites. Our customers who attended the session also noted the explosion of available data in recent years, and the increasing pressure for brands to deliver more personalized consumer experiences. The consolidation of the OTAs and their market share growth has led to increased distribution costs. There are also more distribution channels than ever before, especially since TripAdvisor and Google have released booking features. With consumers expecting more personalized experiences, hotels are suffering from the lack of ability to collect and leverage their guest data to deliver on those expectations. They want to personalize guest experiences on property and to scale 1:1 relationships via email continue building and developing guest loyalty once the guest has checked out. But thus far, the technology has just not been there to enable them to do it as well as they could. Overall, the Revinate customers who participated in the executive roundtable recognized that the guest experience is the driver of all key metrics including guest satisfaction, loyalty, the hotel’s reputation, and in the end, bottom line revenue. Without the technological ability to improve the guest experience and rise to the occasion of consumer demands, hotels cannot continue to improve on their KPIs. In response to these trends and pain points, the participating hoteliers brainstormed solutions. They came up with a list of strategies that hoteliers can either tackle right now or explore their effectiveness in the future. Collecting guest emails was deemed a critical initiative by this group of hoteliers for guest services as well as customer retention and hotel marketing purposes. But the hospitality industry as a whole has not yet determined the best way to successfully collect guest emails. The independent hoteliers discussed a few methods that work well on their properties. Some offer incentives for the front desk to collect guest emails upon check-in. The Charles Hotel in particular also has a system in place that collects email addresses and obtains consent when guests sign in to the on-property Wifi. The group also discussed experimenting with Facebook login for the web to capture additional guest data. The ability to communicate to groups of guests based on commonalities in their data in order to increase the relevancy of guest communications was a hot topic of discussion for this group. Hotels want to segment their guest databases and do a better job of sending targeted, highly relevant emails, but are typically concerned about time and resource constraints. An area to explore, according to the roundtable attendees, was investing in the technological ability to see clear analytics on the direct impact of a specific email marketing campaign. When an email is sent, hoteliers want to know exactly how many people booked and how much revenue was generated to get a clear picture of their return on investment. One of the big initiatives for this group of independent hoteliers was increasing the conversion rates of their brand.com websites to increase their direct bookings. Some of the specific strategies for achieving this goal were to invest in the hotel’s website to improve the user experience, especially on mobile, and to test dynamic content and personalization features. They also discussed testing pricing comparison widgets, so that consumers can feel reassured that they’re getting a good deal without leaving the hotel’s website. When it comes to increasing web conversion rate, one initiative was to find ways to use the website to better convey the value of the hotel’s guest experience, more so than offering discounts. One way this can work is by using data from guest feedback to determine which of the hotel’s amenities or benefits guests value most. A hotel can then feature those specific attributes on its website. 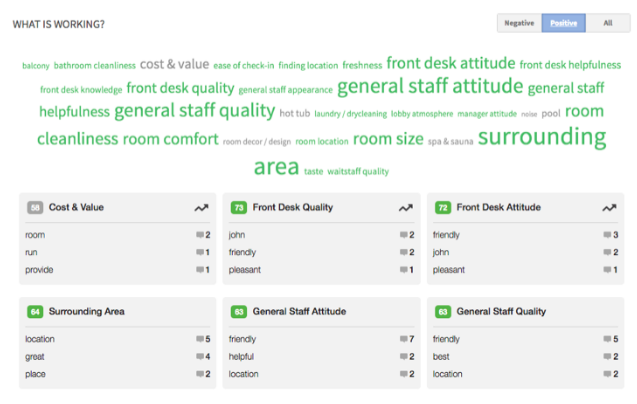 For example, this resort’s feedback data shows that guests mention the surrounding area most often in a positive way. When we dug deeper into this, we discovered that the resort is walking distance from a lot of great shops and restaurants, unlike some of the competitive properties that might be closer to local ski destinations. That is a competitive advantage the hotel has over other properties in the area and should be prominently featured on the hotel’s website to better convey the value of the hotel’s guest experience. The group readily agreed that boosting the number of reviews online, thus improving rankings on review sites like TripAdvisor, was something that every hotel should be doing. There was also some discussion on the value propositions of choosing to focus on TripAdvisor versus Google. Ultimately, the answer to that question depends on your property’s needs with regard to guest acquisition. As part of a holistic multi-channel review strategy, if you have identified a need for your property to improve results at the top of the funnel, then driving more reviews on Google may help you meet your goals. An increase in review volume and review score helps improve local ranking on Google, so not only will you provide customers more content to help make a decision earlier on in the booking process, but you can also amplify the volume to help increase your hotel’s search rankings. The group also identified the challenge in leveraging guest data during the stay, while the guest is on property, to deliver personalized guest experiences. While there is no magic silver bullet on this subject, at this time the participating hotels have all frontline staff entering notes manually into the PMS system, which is a step up from not collecting the information at all. But this isn’t enough. Hotels need a way to programmatically collect and tag data across systems, so that hotel staff can access and leverage it in real time in different areas of the hotel. Even though the participating hotels varied in size, star class, and brand affiliation, it’s clear they face many of the same challenges keeping up to reach the modern traveler. Lots of fantastic ideas were shared around the table and as many hotels are budgeting now for 2017, I think we’ll see a continued shift to focus on capturing direct bookings and more guest personalization. While the group was excited to implement ideas that were discussed, ultimately participants agreed that despite everything, delivering an amazing guest experience is the number one priority in hospitality. I guess that all of us will agree, that in the hotel business delivering an amazing guest experience is the number one priority. Make your guests smile and they will come back. In order to do this, you will have to personalize guest experiences via email, to continue building and developing guest loyalty even before the guest arrives, during their stay, and when the guest has checked out. In the hotel and resorts business you get a lot of the same questions and requests, but it’s very time consuming to reply to all of them with an individual touch and branding in your emails, but nevertheless it’s critical to your business, that you do so. I’ve found this AddIn for Outlook Office 365 called “Ant Text” in the Office Store, for some of my clients, which can help you do just that. I was caught by this Sway about PortoBay Hotel & Resorts https://sway.com/EWE1gdDYMzp6Rs8b and found that “Ant Text” indeed lived up to my, and my clients expectations.